"It's been a long road, but I feel like we have finally found our own "dog whisperer"." Archive CF :: Fun Recipes the Whole Family Can Make! Preheat the oven to 325 degrees and grease the cake pan. Cream together all the wet ingredients first (butter, oil, beef, and eggs), and then fold in the dry ones (flour and baking powder). Crumble beef jerky in at the end. Pour the batter into the cake pan and bake for 60 minutes. Allow the cake to cool before icing it with cream cheese. Decorate with shaved carrots, peas, pieces of your dog’s dry kibble or whatever other healthful ingredients your dog might enjoy. Refrigerate the leftovers. Mix the ingredients together until dough forms. Roll the dough into small balls and place on a cookie sheet lined with parchment paper. Press dough down slightly so the biscuits are about ¼ inch thick. Bake until golden brown and let cool on a wire rack. 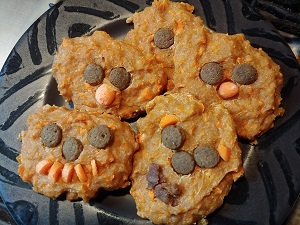 While still warm, decorate as you like, with kibble, carrots and other healthful tidbits. Optional: Add ½ tsp of salt to help extend the shelf life. 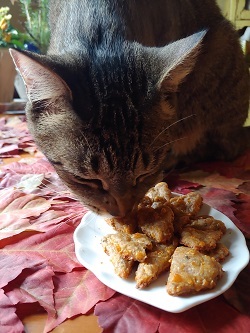 For the Apple Carrot treats, if the dough is really sticky, add a few more Tbsp of flour. Decorate with shaved carrots, peas, pieces of your dog’s dry kibble or whatever other healthful ingredients your dog might enjoy. Combine the cheeses and yogurt. Add the flour and cornmeal. Add water 1 Tbsp. at a time until the dough sticks together. Knead the dough into a ball, then roll it out to ¼-inch thickness. Cut into 1-inch squares. 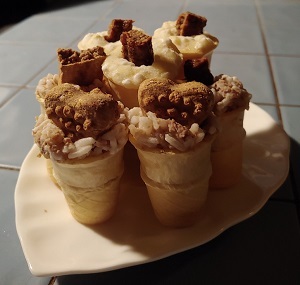 Stuff the cones with anything your dog likes – cottage cheese and apple sauce, yogurt and pumpkin puree, peanut butter and cheerios, canned food and rice, or boiled chicken and rice for the pooch with a sensitive stomach. Decorate with a dog treat. Freeze overnight. So, in this season of giving, how about whipping up a batch of cookies and sharing them with homeless dogs and cats at a shelter near you? Or perhaps organize a bark sale and donate the proceeds to your local animal shelter. Giving is indeed a gift to the giver, too! 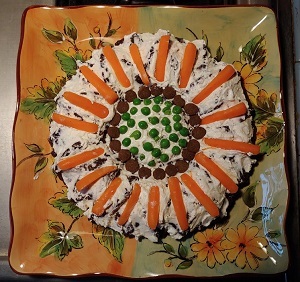 If in doubt when decorating your creations, consult the ASPCA webpage for human foods that are dangerous to our pets.